Filipino community leaders and the U.S. Secret Service are making preliminary plans for a visit to Hawaii by Philippine President Gloria Macapagal Arroyo next month. Arroyo told Filipino community leaders in Manila last month that she plans to visit Hawaii in September to celebrate the centennial of Filipino immigration to the state, said Vergel Adonis, who was at the meeting at Malacanang Palace on July 15. » She became the 14th president of the Philippines on Jan. 20, 2001, after a peaceful People Power uprising that ousted former President Joseph Estrada. » She won an election for president in 2004. » She began her political career in the Senate in 1992 and was elected vice president in 1998. » She is the daughter of former Philippine President Diosdado Macapagal. U.S. Secret Service Agent in Charge Al Joaquin said there are tentative plans for an Arroyo visit next month, but nothing has been confirmed. Arroyo is expected to attend the Asia-Europe Meeting Summit on Sept. 10 and 11 in Helsinki, Finland, and might also make a stop at the United Nations on the way back. The timing would be right for a stopover in Hawaii, said Geminiano "Toy" Arre, executive director of the Filipino Community Center. But Arre added there has been no official word yet from the Philippine government. If she comes, Arroyo will help unveil a sakada statue -- if it arrives in time -- at the Filipino Community Center. The statue is a duplicate of one that Gov. Linda Lingle helped dedicate in Port Salamague in Ilocos Sur during her visit to the Philippines in January. Port Salamague was the departure point for many of the sakadas who immigrated to Hawaii to work in the sugar and pineapple plantations. The statue is being cast and shipped from the Philippines, Arre said. If it does not arrive in time for the visit, another event for Arroyo will be planned. Arroyo had been invited to visit Hawaii in December for the conclusion of the centennial celebration. But Arre said the Philippines is hosting a summit meeting of leaders of the Association of Southeast Asian Nations and Arroyo would not be able to come in December. A spokeswoman for Lingle referred questions about a possible Arroyo visit to the Philippine Consulate. The consulate had no comment except to confirm that Arroyo said she is planning to come in September. The Philippine president last visited Hawaii on Oct. 24, 2002, on her way to a summit meeting in Mexico. During her stopover, Arroyo had lunch with Gov. Ben Cayetano, the first U.S. governor of Filipino ancestry, and met with U.S. Sen. Daniel Inouye and then-Commander in Chief of Pacific Forces Adm. Thomas Fargo. She was also the guest of honor at a dinner for about 1,200 people. But the highlight of her trip was a visit to the Filipino Community Center, where she met with sakadas and students and planted a narra tree as a symbol of friendship between Hawaii and the Philippines. The narra is the national tree of the Philippines. About 200 people waited outside the center for hours just to catch a glimpse of the Philippine president. Security was extremely tight for Arroyo's visit. Police shut down the freeway and surface streets for her motorcade, and traffic backed up on Kalakaua Avenue from Waikiki through Beretania Street in Makiki. 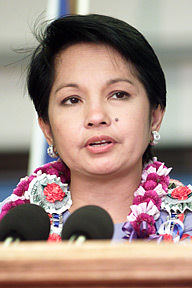 Arroyo was also in Hawaii for two days in September 1998 when she was vice president of the Philippines. Arroyo, who has a doctorate in economics, was here to promote business ties between Hawaii and the Philippines.